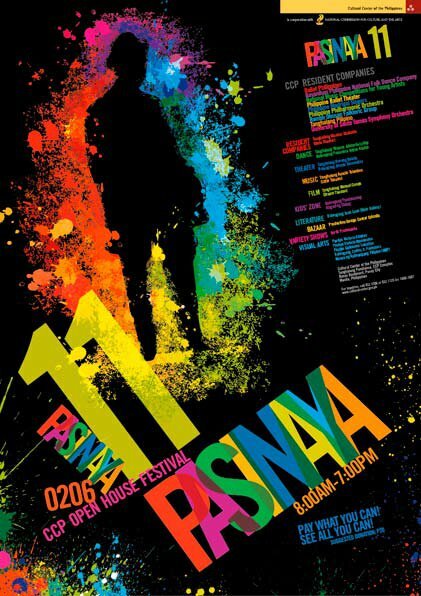 Dubbed as the biggest one day multi-arts festival in the country, PASINAYA 2011 opens the National Arts Month festivities with a harvest of performing arts productions. On Sunday, February 6, 2011, from 8am to 7pm, the public can choose from over 120 performances from the nation’s different performing arts groups at a “See all you can, Pay what you can” scheme. A limited number of Priority Passes will be on sale on the day of the Festival for Php100 each. For more information, please call the Performing Arts Department at 8321125 local 1600 – 1607, 1611. For the Pasinaya events schedule, click here. Schedule is subject to change.